The Danforth shooting was a mass shooting that occurred on Danforth Avenue in the Greektown neighbourhood of Toronto, Ontario, Canada, on the night of July 22, 2018. Faisal Hussain killed two people and wounded thirteen (eight directly) using a Smith & Wesson M&P .40-caliber semi-automatic pistol. He committed suicide after a shootout with Toronto Police Service (TPS) officers. Around 10:00 p.m. EDT on July 22, 2018, a lone gunman walked along Toronto's busy Danforth Avenue in the Greektown area of the city, randomly shooting pedestrians before opening fire on crowded restaurants. The incident began around Danforth Avenue and Logan Avenue near the restaurant named Christina's. Witnesses described 10 to 15 blasts similar to firecrackers, while others reported hearing gunshots and seeing a man holding a gun. Further along the Danforth at Chester Avenue, witnesses said they saw a man shooting from a sidewalk into another restaurant named Demetre's. The shooter continued to walk westbound on Danforth towards Hampton Avenue, where witnesses said the shooter crossed the street from the north side to the south side and fired into the 7Numbers restaurant near Bowden Street where one victim was shot. The shooter chose not to shoot certain people he encountered, telling one man, "Don't worry, I'm not going to shoot you." TPS officers responded to calls from witnesses and located the gunman on Bowden Street and exchanged gunfire with the suspect. The gunman ran back to Danforth where he was found dead. At the corner of Danforth and Logan, police closed off an area from bystanders and detonated a package for undisclosed reasons. 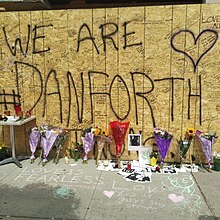 People of Toronto left floral tributes for 18-year-old Reese Fallon with the message "We are #Danforth"
TPS reported that 18-year-old Reese Fallon and 10-year-old Julianna Kozis were killed in the attack. Thirteen others suffered gunshot wounds, ranging in age from 17 to 59. Toronto Paramedic Services transported eight victims to trauma centres – including four people to St. Michael's Hospital, three to Sunnybrook Health Sciences Centre and one to The Hospital for Sick Children. St. Michael's reported it was treating five patients. Three of them underwent immediate lifesaving surgery after the shooting and the others were in serious but stable condition. Two gunshot victims were treated at the nearby Michael Garron Hospital and were in stable condition. Five other patients were treated for issues "in relation to the shooting", but were not shot. The Special Investigations Unit (SIU) identified the perpetrator as 29-year-old Faisal Hussain. Hussain was born to Canadian parents of Pakistani origin according to people who knew the family. In a public statement, Hussain's parents said that he was psychotic and depressed throughout his life. In 2010, Hussain told a friend that he was seeing a psychiatrist about these problems. A former teacher described him as "very disturbed" and recounted having to take him to a psychiatric facility after he started carving into his face with the blade of a pencil sharpener. Another former teacher called the police after Hussain allegedly said, without prompting, that "it would be really cool to kill someone." His family had been struggling through the death of his sister in a car accident and his brother's ongoing coma after an overdose or a stroke. According to a neighbour, Hussain was not religious and declined to participate in Friday prayers. According to his brother, Hussain had "started attending a mosque with his father, but did not seem that interested in religion." In 2010, Hussain was investigated by TPS under the Mental Health Act. On July 24, 2018, the Ministry of Public Safety said there is currently no connection between him and national security. He was not on any federal watchlists. In the immediate aftermath of the shooting, police did not identify a motive, saying that they were investigating "every possible motive, including terrorism." On July 23, police executed a search warrant at Hussain's residence in the Thorncliffe Park neighbourhood of the city. A day later, CBS News published that, according to a law enforcement source, Hussain visited ISIL websites, may have expressed support for the Islamic militant group and could have lived in Afghanistan and Pakistan, but was not apparently directed by ISIL. 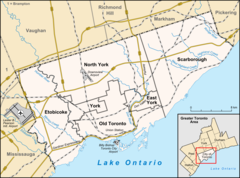 On July 25, Amaq News Agency, citing a "security source", stated that he was "from the soldiers of Islamic State", yet Toronto Police said there was no evidence of an ISIL connection. Amarnath Amarasingam of the Institute for Strategic Dialogue doubted Amaq's claim and said it may have been prompted by the CBS News article. Since Hussain was found dead after a shootout, the SIU looked into whether he was shot by police or shot himself. On July 23, it removed a police cruiser from the scene and said the two officers in it were being investigated for their roles in the shootout. Hussain's handgun was also seized. On July 25, a police source told CBC News that Hussain committed suicide. The same day, a police source told CP24 the gun was from the United States and had been obtained from a "gang-related source". A police source later told CTV it had been stolen in 2015 during a Saskatoon burglary. It may have come to Hussain from his brother who lived at a house in Pickering where 33 guns were seized in 2017. Residents and business owners in the area started a crowdsourcing campaign for funeral expenses of victims who died. Meanwhile, the Canadian Blood Services said that they were closely monitoring response efforts and were encouraging donations in the aftermath of the shooting. The Toronto International Film Festival cancelled an event to promote its planned film slate out of respect for those affected by the shooting. Canadian Prime Minister Justin Trudeau and Minister of Public Safety and Emergency Preparedness Ralph Goodale tweeted their condemnation of the shooting and praise of the police. Ontario Premier Doug Ford described the attack as "the most brazen shooting" of a year full of gun violence. Toronto Mayor John Tory called the shooting an "unspeakable act" and an attack on a city with a gun problem. He said he planned to discuss public safety and the legality of guns with provincial and federal officials. The Ministry of Foreign Affairs of Greece expressed solidarity and condolence with the city's Greektown. Calvary Church, located near the site of the shooting, held a prayer vigil, joined by a congregation from the nearby Madinah Mosque. The family of Faisal Hussain released a statement expressing "our deepest condolences to the families who are now suffering on account of our son's horrific actions". Several sports teams and athletes showed their support on social media with the #TorontoStrong hashtag, which was also used after the van attack in North York Centre in April 2018. ^ a b Warmington, Joe (25 July 2018). "Danforth shooter was 'armed for war,' sources say". Toronto Sun. Retrieved 7 August 2018. ^ "Danforth shooting: SIU says 'no basis' to lay charges against Toronto police in gunman's death". Global News. January 16, 2019. Retrieved January 16, 2019. ^ a b c d "Faisal Hussain ID'd as gunman in deadly Danforth shooting attack". ^ "Toronto shooting: Gunman kills woman and child in Greektown". BBC. July 23, 2018. Retrieved July 23, 2018. ^ a b c "Faisal Hussain, gunman in Danforth shooting rampage, killed himself: police source". CBC News. 25 July 2018. Retrieved 25 July 2018. ^ Lyons, Kate (July 23, 2018). "Toronto shooting: woman and gunman dead, 13 others injured in Danforth Avenue attack". The Guardian. Retrieved July 23, 2018. ^ Swenson, Kyle (July 23, 2018). "Toronto mass shooting: 14 hit, 1 dead, as gunman opens fire Sunday night. Shooter killed". The Washington Post. Retrieved July 23, 2018. ^ a b c "10-year-old girl, 18-year-old woman killed in Toronto mass shooting". The Globe and Mail. July 23, 2018. Retrieved July 23, 2018. ^ "'There's a man with a gun!' Chaos descends upon the Danforth - The Star". thestar.com. Retrieved January 10, 2019. ^ a b c d e f g h "Woman and girl dead, 13 other people injured in Danforth shooting in Toronto". CBC News. July 22, 2018. Retrieved July 23, 2018. ^ "Toronto police search for clues to killer's path". Retrieved February 13, 2019 – via The Globe and Mail. ^ a b c "Latest updates: Girl, 10, and woman, 18, dead in Toronto rampage". CTV News. ^ "Police identify girl killed in Danforth rampage as Julianna Kozis". cbc.ca. 24 July 2018. ^ "Mass shooting in Toronto: Three killed, 13 injured after gunman opens fire on Danforth". CTV News. Retrieved July 24, 2018. ^ a b "Toronto Shooter's Neighbors Unaware of His Mental Illness". The New York Times. ^ a b "Toronto gunman had 'severe mental health challenges', according to family". Global News. Retrieved 2018-07-25. ^ "Toronto gunman a puzzle to his own tight-knit immigrant community". Reuters. July 24, 2018. Retrieved July 25, 2018. ^ "'Like 2 different people': Friend of Faisal Hussain struggles to understand what sparked Danforth rampage - CBC News". cbc.ca. Retrieved July 25, 2018. ^ "Danforth shooter 'was afraid he was going to hurt people' - The Star". ^ "Toronto mass shooter Faisal Hussain previously said 'I want to kill someone': former teacher". 25 July 2018. ^ Amanda Coletta (27 July 2018). "Gun in Danforth shooting stolen in Saskatoon break-and-enter: source". CTV News. Retrieved 30 July 2018. an overdose left him in a coma in a hospital, where he remains today. ^ Brean, Joseph; Edmiston, Jake (July 24, 2018). "Who was Faisal Hussain? Toronto gunman was quiet and 'not normal,' neighbour says". National Post. Retrieved August 4, 2018. ^ a b Powell, Betsy; Gillis, Wendy (September 20, 2018). "Details on Danforth gunman revealed in documents police filed to obtain search warrant". The Toronto Star. ^ a b "Danforth shooter investigated under Mental Health Act in 2010: Source". ^ "Authorities say no link to terrorism in Toronto rampage,". Associated Press. 24 July 2018. Retrieved 24 July 2018. ^ Jones, Sheena; Park, Madison (July 23, 2018). "Attacker in Toronto rampage that killed 2, injured 13 is identified". CNN. Retrieved July 24, 2018. ^ "Toronto shooting rampage: New details emerge about gunman Faisal Hussain". cbsnews.com. Retrieved July 25, 2018. ^ "'No evidence' Danforth shooter Faisal Hussain connected to ISIS, Toronto police say". ^ "Islamic State claims responsibility for Toronto mass shooting, yet provides no evidence". ^ "Toronto shooter's gun was illegal, originally from U.S.: source". ctvnews.ca. 25 July 2018. ^ Coletta, Amanda (July 27, 2018). "Gun in Danforth shooting stolen in Saskatoon break-and-enter: source". ^ Trevor Dunn (27 July 2018). "Danforth killer had no criminal record, but guns, gangs and drugs weren't far away". CBC. Retrieved 30 July 2018. Farad Hussain, 31, has ties to a street gang in the Thorncliffe Park area of Toronto, and may have once possessed the handgun his brother used in the Danforth shooting. ^ a b Yousif, Nadine (July 23, 2018). "How you can help the Toronto shooting victims". The Globe and Mail. Retrieved July 24, 2018. ^ "Feds looking at ways to tackle wave of gun violence in Toronto: Minister". ctvnews.ca. July 23, 2018. Retrieved July 25, 2018. ^ Flanagan, Ryan (July 23, 2018). "'Confidence is shaken': How will Toronto respond to gun violence?". CTV News. Retrieved July 23, 2018. ^ "Suspected Danforth shooter's family cites psychosis, 'severe mental health challenges,' after SIU identifies him as Faisal Hussain, 29, of Toronto". The Toronto Star. ^ "Faisal Hussain ID'd as gunman in deadly Danforth shooting spree". ^ "Sports world shows support for Toronto in wake of tragic shooting". Sportsnet. Retrieved July 24, 2018.